Team CUNNINGSTUNTS • View topic - sup dawg? Stay safe and hope your all well. STOOOOOOOOOGE! how you goin mate? great to see you back on a bike POST SOME VIDS! Good to hear from you. Great to hear your poping down this way, keep me posted! Say Hi to the rest of the guys. PS: Ridin the streets leaves lot stuntin for dead! get out there are rock the streets ya kharns! rocking the streets is why my 600rr got defected and no longer registered the under cover cop for some strange reason thought different to me about scrapping my bar down a main road infront of traffic hahaha. I did manage to talk my way out of getting arrested and having the bike impounded though. oh and getting a dangerous riding ticket wich would have been instant 12months lose of licence. Sheeeeeeet! Still my fav trick endos... nothing is better than seen them rocked like that. Of course, the backward facing wheelie was like WTF! 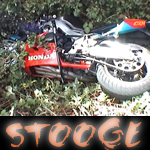 im with Stooge. something bout just floating along on the front wheel further than what some ppl can do on the back haha. Carlos!! How's Tasmania going?? Been a while since I've been on here. Hope all is well, good to hear you are still rockin some stunts!